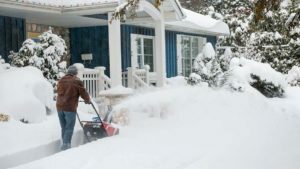 Should seniors buy a snow blower or should they hire a neighbor to clear the driveway of snow? They can also hire a commercial snow clearing company to remove the snow. Unless they are exceptionally fit, shoveling snow should be out of the question. There is just too much risk of a heart attack from over exertion. Many seniors may also not be comfortable operating as snow blower. Hiring someone to clear the snow will cost money. However it may be the safest approach in the long run. Better to be healthy than sorry. Our personal opinion is no. Do not purchase a snow blower unless you are comfortable with their operation. Hire someone to do the work instead. In addition to clearing snow from the driveway, have the steps also cleared as well. Make sure you understand when the snow will be cleared and how often. Some snow clearing companies will wait until the snow plows have plowed the road in front of your home. They will clear the snow dumped in your driveway by the plow as well as clear your driveway at the same time. They really do not want to come to your place more than they need to. The answer to the question, does snowblower size matter, is not really for most people. If you have a single car width driveway or even one that is two car widths wide, it really will not take long to clear the snow. Unless you have a really long driveway, then 10 minutes of snow blowing and your done, even with a smaller 24 inch wide machine. You may need 5 to 10 passes depending on the width of the driveway and your done. Long driveways will take longer to clear with a small snow blower. If time is not a factor for you then no worries about a small machine from this perspective. Larger snow blowers, 28 inch and larger are heavier and come with more powerful engines. They tend to slip less on the ice and snow and they have the power to chop through snow drifts and blow it further. It might still only take ten minutes, but you struggle a lot less with heavy snow. Consider the snow that the snow plow dumps in your driveway. This is hard packed and sometimes with chunks of ice mixed in. A stronger more powerful snow blower will deal with this snow much easier than the smaller ones. Power, weight and size do matter in these conditions. Having operated both a 24 inch and a 28 inch snowblower with a 2 car width driveway that is 2 car lengths long, I can tell you that I am much happier with the larger machine. The extra power that comes with the extra weight makes a huge difference in heavy wet snow conditions. Multi Speed – allows you to slow the forward speed down in heavy snow and speed it up for lighter snow conditions as well as transporting from one location to another. 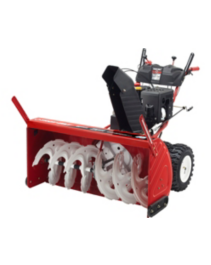 Single Hand Operation – allows you to control the forward speed and engage the auger at the same time while adjusting the direction your blowing snow by adjusting the chute. Chute Control – the minimum is a crank that allows you to turn the chute in the direction you want to blow the snow. Some controls offer height adjustment as well, although these appear to be more difficult to control. Headlight for Night Time Operation – in most urban areas there is more than sufficient light to blow snow at night. But a headlight provides safety as well allowing cars to easily see you on the side of the road with the headlight in operation. Accelerator – adjusts the power levels for whatever conditions you are dealing with. Electric Starter – makes starting your snow blower very easy. Some can be more difficult to start manually especially when the engine is still cold. Easy Maneuverability – included on most larger machines, these controls allow you to lock one wheel or the other to turn the machine in the direction you want to go. Turning a snowthrower can be difficult if you are on pavement. Handgrips that are Heated – this is a nice to have feature especially if you are blowing snow in really cold weather. The first thing to get cold is the finger tips and this feature is much appreciated by many consumers. Sufficient Power – more powerful machines will make a faster job of clearing snow and often have more features such as the heated grips and easier maneuverability. Having used both large and small machines, the writer much prefers a 28 inch or larger width snow thrower. Easy Maintenance – in most cases maintenance consists of changing the oil, lubricating the chute and auger, checking the spark plug and belts. Decide if you are comfortable with these small jobs or will need a maintenance plan. 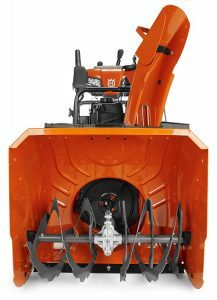 Thousands of snowblowers are purchased every year and consumers have a variety of priorities about the features they feel they need in a snowthrowing machine. Our web site team has completed some research to come up with the popular snowblower features that matter to most consumers. We also provide a description of each and why they feel this feature was important to them. 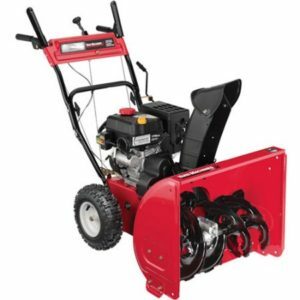 If you are looking for a snowblower, add these items to your check list of features that may be important to you. Obviously price is important but sometimes it does not make sense to forgo these features. You are going to be using this snowblower for many years, so make sure it is what you want and are comfortable operating it. Airless Tires – more and more companies are offering this feature. No flat tires to repair and soft tires to fill with air. Easy turn controls – allows the operator to steer the machine with the press of a button or lever. Wresting a heavy machine can be difficult to do in snow conditions. Heated Hand grips – keep your fingers warm particularly in extremely cold weather. It is the fingers even in heavy duty gloves that are the first thing to get cold. Electric Starter – makes it much easier to start the engine, especially when they are cold and sometimes difficult to start with a pull chord. Engine Speed control – adjusting the engine speed is another way of controlling the ground speed and the snow throwing distance. Headlight – provides safety at night as well as lights your way along the edge of roads and sidewalks. Controls for Chute direction – Ensure that the controls for setting the direction the snow is thrown are easy to use and easily available to the operator. Some machines will also have controls to adjust the height of the snow throwing chute as well. Multi Speed Forward and Reverse – multiple speeds in both directions allow you to adjust the speed to coincide with the ground conditions, the density of the snow etc. High speed for light snow and ground transfer, slow speed for heavy snow clearing makes removing the snow much easier. Single Hand Operation – is also useful when you need to steer with one hand and adjust the throttle engine speed or adjust the chute direction at the same time, without having to stop forward motion. There are literally hundreds if not thousands of snow blower models available on the market from a variety or retailers and manufacturers. How do consumers know which one to choose and what features are important to them? We decided to list the popular snow blower features here to help consumers make decisions on how much they want to spend. Typically the more features they come with the more expensive the snow blower will be. The other major factor associated with cost is obviously the size of the machine. The one shown in this picture comes with everything. It is a larger machine as well which means it is going to cost more. Let us know what you think and if there are any that we missed on our list. We also have our own favorites on our wish list of popular snow blower features. Electric Start – can be really handy for a couple of reasons. First it is just easier to start these machines. They all come with a pull chord which can be used, however if your snow blower is giving you trouble starting, the electric start will be much appreciated. Single Hand Interlock – allows you to change the direction and angle of the chute on the fly. You can drive with one hand and adjust the chute with the other instead of stopping to change directions. This is really handy if you have tight situations where the snow must be blown at a different angle as you move along. Remote chute and Deflector Rotation – most two stage snow blowers have this feature and it allows you to adjust the chute from behind the snow blower machine. Power Steering – even the smaller machines weigh over 200 pounds and the big ones much more. Instead of having to manhandle the machine to change direction, you can use the power steering option which will slow one wheel to make the machine turn in the direction you need. Track Drive – provides much more traction than regular tires. You can use chains but they are troublesome to use. consumers dealing with slopes will appreciate the track drive when they are climbing up their sloping driveway over icy conditions. If you have a flat slope tires should be fine. Are handy if you receive lots of snow and drifting snow that create drifts higher than your snow blower. Hand Warmers – are really great if you are going to be blowing snow for longer than 15 minutes in extremely cold temperatures. No matter what kind of gloves you have, your fingers are going to get cold unless you have handles equipped with hand warmers. Our next post in two weeks will indicate what our personal favorites are and why. In the mean time evaluate your own preferences based on your personal needs. Consider the cost to acquire a machine with the features you need.